Low-concentration PV array provides promise of better LCOE and amplifying cell factory capacity. Back in January of this year, SunPower (Nasdaq: SPWR) announced the first commercial deployment of its C7 low-concentration (seven suns) PV tracker -- a 1-megawatt power plant at ASU's Polytechnic campus in Mesa, Arizona built by SunPower and Salt River Project. SunPower claims its C7 Tracker has up to a 20 percent lower levelized cost of electricity (LCOE) than competing technologies. SunPower did not clarify whether those competing technologies were other low-concentration PV (LCPV) or fixed flat-plate solar panels or panels on trackers. The firm did maintain that the C7 tracker provides "the lowest levelized cost of electricity for utility-scale solar power plants available today." SunPower also said that "a 400-megawatt C7 Tracker power plant requires less than 70 megawatts of SunPower solar cells." The concentrator would effectively allow the company to increase the power output of its utility-scale solar plants at a time when gaining silicon cell efficiency the old-fashioned way is becoming more challenging. SunPower will soon mass-produce monocrystalline solar cells with an efficiency rating of more than 23 percent, and the company has demonstrated new cells in the lab that can hit 24 percent. Concentrators work best in high DNI regions, and that applies to low-concentration as well. So it makes sense that the next deployment for this technology is also in the U.S. Southwest. It's a six-megawatt facility that's also slated to include two megawatts of SunPower's solar roof tile product for Tucson Electric Power. "The SunPower C7 Tracker leverages two decades of experience in reliable tracking systems to deliver bankable technology, guaranteed performance and the greatest return on investment for utility customers," said Howard Wenger, SunPower President, Regions in a release. 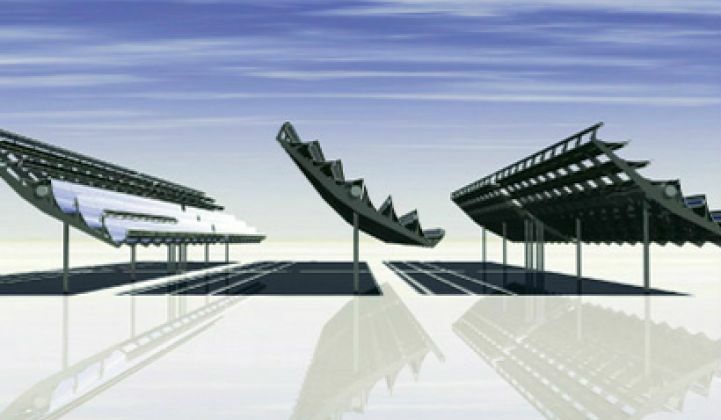 The LCPV architecture from SunPower is a single-axis tracker with rows of parabolic mirrors, bouncing sunlight onto SunPower's high-efficiency solar cells. The C7 tracker installation for TEP will start construction early next year, with completion expected in December 2013. Tucson Electric Power is an investor-owned utility (IOU) with more than 404,000 customers in southern Arizona. Richard Swanson, founder of SunPower, remarked at an IEEE event last month that the concentrator allowed SunPower to markedly amplify the megawatts it deploys without increasing factory cell capacity. One unanswered question is the impact of the increased heat and "hotspots" on the silicon solar cells. Other vendors working with low-concentration sunlight on silicon solar cells include Skyline Solar and Cogenra's CHP system.